I do love fairy tale retellings. 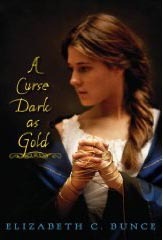 A Curse Dark as Gold takes the basic story of Rumpelstiltskin and sets it in a woolen mill shortly before the Industrial Revolution. The author retains the feeling of magic and romance, and gives us a determined and strong heroine. When Charlotte Miller's father dies, leaving an enormous mortgage on the mill, Charlotte knows she must do something to keep Stirwaters running. The entire village depends on the mill for their livelihoods. But everyone says there's a curse on the mill, and as soon as Charlotte and her sister Rosie overcome one seemingly insurmountable obstacle, another one rises up to take its place. So when a strange man who calls himself Jack Spinner offers to help, Charlotte seems to have no choice. This story is dark, as it does involve curses and difficulties. But Charlotte is such a determined, capable character, you quickly find yourself rooting for her to succeed, even though you can't imagine how she'll pull it off. This is a magnificently written book, and I'm excited to learn it's Elizabeth Bunce's first. If this is how she begins her writing career, I will eagerly wait to see what she writes next!